It’s time to get small and live large, as Matt Damon stars in the hilarious and original comedy, Downsizing. To celebrate the digital, DVD and Blu-ray™ release coming up on May 28th, this competition gives you the chance to win a copy of the action on DVD! When scientists find a way to shrink humans to five inches tall, Paul Safranek (Matt Damon – The Martian) and his wife Audrey (Kristen Wiig – Ghostbusters 2016) decide to ditch their stressed out lives in order to get small and live large in a luxurious downsized community. Filled with life-changing adventures and endless possibilities, Leisureland offers more than riches, as Paul discovers a whole new world and realises that we are meant for something bigger. 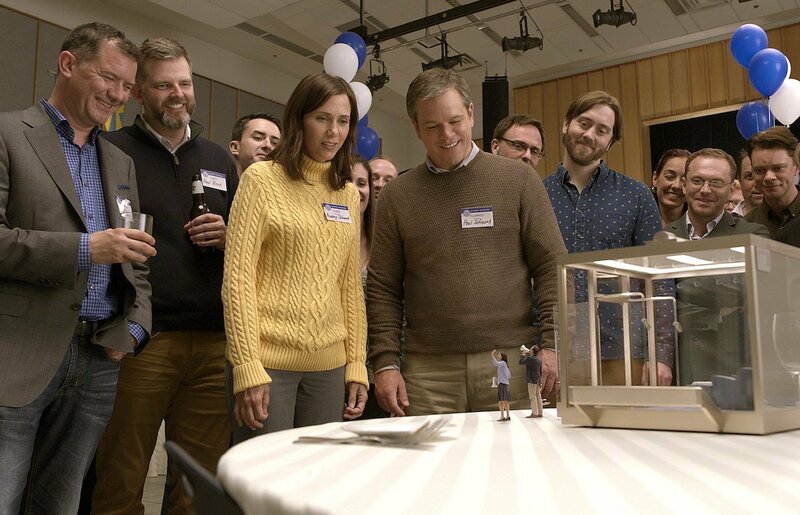 In the trailer, Matt Damon and Kirsten Wiig discover that if they were to downsize, their savings of $100,000 would be worth how much? Like Paramount Pictures on Facebook and follow on Instagram for all the latest news and information. Keep an eye on Flickfeast on Twitter and Facebook for our review and further competitions. Thanks for the chance to win – missed this at the cinema, but really wanted to see it… fingers-crossed for the win! Congratulations Greig! You are the winner of our Downsizing giveaway! Send us a message (via Twitter or Facebook is best) with your details and we’ll arrange getting your prize to you!